"Our Annual Meeting is rapidly approaching, and we urge all ADP stockholders to protect the value of their investment by voting the WHITE proxy card today in support of ADP's 10 highly qualified directors today," said John P. Jones, Chairman of the Board. "Earlier this week, we were pleased to gain the support of leading independent proxy advisory firm Institutional Shareholder Services (ISS), which recommended that stockholders support ADP and vote for nine of our 10 directors on the WHITE proxy card and withhold on Director Eric Fast. While we are very pleased with ISS' overall recommendation, which validates the successful oversight by our highly qualified Board of ADP's strong track record and execution of our 'All in on HCM' strategy, we disagree with the withhold recommendation." "Eric Fast is an extremely valuable member of ADP's Board of Directors, who epitomizes ADP's core value of 'Integrity is Everything.' In his role as Chair of ADP's Audit Committee, Eric has continually demonstrated his commitment to the highest ethical standards in overseeing our financial disclosures and reporting process. Since joining the Board in 2007, Eric has also been sharply focused on working with the entire Board and management to oversee ADP's strategic plan to deliver superior long-term value to shareholders. His deep financial, transactional, risk management and accounting experience are extremely important skills for the Board, and his leadership as Chair of the Board's Audit Committee and member of the Compensation Committee contributes the expertise and tenured perspective necessary to support ADP's financial performance and strategic execution." The letter to stockholders is available here and additional information related to ADP's 2017 Annual Meeting of Stockholders can be found here. Additionally, a video message from CEO Carlos Rodriguez and Chairman John Jones about your investment in ADP is available here. The 2017 Annual Meeting of Stockholders is fast approaching on November 7. Your vote in support of ADP's 10 highly qualified Directors is critical to protecting the value of your investment and ensuring the ongoing success of ADP -- a company that plays an important role in the U.S. and global economy. 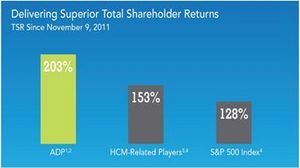 ADP is the largest Human Capital Management (HCM) provider in the cloud, with 83% of its clients using cloud-based strategic platforms. We pay 1 in 6 American workers and approximately 14 million international workers, and remit 25% of all taxes collected from U.S. employers. Your Board of Directors actively oversees ADP's corporate strategy and has been keenly focused on generating value for our 700,000 clients around the world by providing trusted and reliable service, as well as to our shareholders by delivering annual dividend increases for 42 consecutive years and Total Shareholder Returns (TSR) that have significantly outpaced the S&P 500 Index. Pershing Square, the hedge fund run by Bill Ackman, is seeking to remove three of ADP's most experienced Directors -- Chairman John Jones and Directors Eric Fast and Glenn Hubbard -- and to place its own hand-picked nominees on your Board. Importantly, Institutional Shareholder Services, a leading proxy advisory firm that provides independent advice to shareholders, has recommended that ADP stockholders vote on ADP's WHITE proxy card. Its support is further evidence that ADP has the right strategy and Board in place to continue delivering value for our clients, employees, stockholders, and the 40 million workers globally who rely on our services. We know you have seen a number of communications regarding the upcoming Annual Meeting and election of your ADP Directors, and we are writing to you today to summarize why ADP's Board is the right team for ADP -- and why Pershing Square's nominees and their risky call for a rapid acceleration in ADP's already-healthy margins could cause serious harm to ADP and your investment. ADP Total Shareholder Returns (TSR) have consistently outperformed the market. No matter how you choose to calculate it, ADP's TSR has outperformed the S&P 500 Index. TSR during Carlos Rodriguez's tenure is 203%. Although your Board made the decision to spin-off CDK, if one excludes CDK post-spin from the TSR calculation, as Pershing Square has advocated, ADP's TSR would be 190%1, still well above the S&P500 Index TSR of 128% and our HCM peers' TSR of 153%. 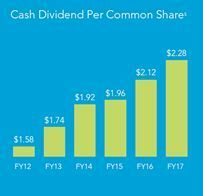 ADP also has returned $11.3 billion to its investors since FY 2011 through dividends and share repurchases. ADP's strategy is driving consistent revenue growth and ongoing margin expansion. Since FY 2012, ADP has delivered compound annual revenue and adjusted EPS growth rates of 7% and 10% respectively2. ADP has also increased net operational margins by 580 basis points since FY 20112. Additionally, ADP has maintained annual client retention above 90% for each fiscal year since FY 2011. We have delivered margin improvements by increasing our productivity and cost efficiency in the near term -- and we're also focused on making the right investments to drive revenue and earnings growth and margin expansion over the longer term. Mr. Ackman says he can improve ADP's margin by 1,200-1,600 basis points3, but he has provided no specific plans to reach that target. We fail to see how Mr. Ackman could possibly achieve that level of margin improvement without conducting massive layoffs, and thereby imperiling client service and curtailing investments that are essential to ADP's future success. Following Mr. Ackman's reckless plan would put ADP's business and your investment at significant risk. ADP's Board has the right skills and experience to represent all shareholder interests. ADP's Directors have a deep understanding of the HCM marketplace and ADP's competitive position, and they continue to guide the successful execution of our strategic plan to deliver long-term value to all of our shareholders. Pershing Square directly owns 2% of common shares, yet is seeking 30% of ADP's Board seats4. Pershing Square wants to remove three of our most experienced Directors who provide continuity and leadership essential to the Board's effectiveness, and replace them with nominees who lack relevant technology or HCM experience, which are important skills to the future of ADP. Despite Pershing Square's public claims to the contrary, the three ADP Directors Pershing is targeting for removal -- Chairman John Jones and Directors Eric Fast and Glenn Hubbard -- each own more than $4.2 million in ADP stock5 -- significantly more than any of Pershing Square's nominees own personally. Leading analysts, journalists and proxy advisors explain why it makes sense to support ADP's Board, management team and strategy. We strongly urge you to vote for all of ADP's 10 highly qualified and experienced Director nominees. Click on VoteADP.com/video to view a message from CEO Carlos Rodriguez and Chairman John Jones. To view all shareholder letters and additional information on the 2017 Annual Meeting of Stockholders, visit VoteADP.com. 1 ADP TSR of 203% is from close on 11/9/2011, the date Carlos Rodriguez was announced as ADP CEO, to intraday price of $111.65 as of 12:00PM on 7/27/2017, which is the assumed ADP "unaffected" price prior to Pershing Square's activist campaign becoming public; this TSR calculation assumes shareholders have held their CDK shares since CDK was spun off from ADP on October 1, 2014 and all ADP and CDK dividends have been reinvested on the ex-dividend date. If CDK were valued as a dividend at the spinoff date and reinvested in ADP, ADP TSR is 190%. 2 ADP TSR of 203% is from close on 11/9/2011, the date Carlos Rodriguez was announced as ADP CEO, to intraday price of $111.65 as of 12:00PM on 7/27/2017, which is the assumed ADP "unaffected" price prior to Pershing Square's activist campaign becoming public; this TSR calculation assumes shareholders have held their CDK shares since CDK was spun off from ADP on October 1, 2014 and all ADP and CDK dividends have been reinvested on the ex-dividend date. If CDK were valued as a dividend at the spinoff date and reinvested in ADP, ADP TSR is 190%. 4 According to the Schedule 13D Amendment filed on August 31, 2017 by Pershing Square Capital Management, L.P., PS Management GP, LLC and William A. Ackman (collectively, "Pershing Square"), Pershing Square's ownership interest in ADP is comprised of: (i) 8,798,442 shares of ADP's common stock ("Shares") and (ii) 28,005,233 Shares underlying listed and over-the-counter American-style call options. According to published reports and statements by William A. Ackman, CEO of Pershing Square Capital Management, L.P., Pershing Square did not elect to convert all of those securities in advance of the September 8, 2017 record date for ADP's 2017 Annual Meeting of Stockholders (the "Annual Meeting"), and as a result, only the approximately 2% of ADP's common stock held by Pershing Square in the form of Shares can be voted by Pershing Square at the Annual Meeting. 5 Based on ADP's closing stock price of $117.01 on October 23, 2017.